Fragrance is often compared to music, and I won't bore you with recounting why; either you already know or you can easily look it up just about anywhere (here, for instance.) 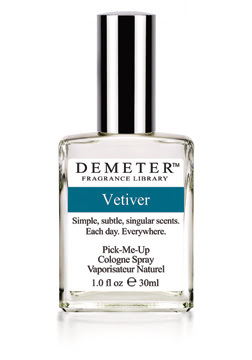 When I smelled Demeter's Vetiver for the first time, it struck me as being musical in a way I had never experienced before, something wholly new to me. At first, Vetiver has a lemony, cologney feel to it, but this boils away pretty quickly and what you're left with is that rooty, green-grass smell of classic vetiver. It may be partly or wholly synthetic--at that price, it surely must be--but it's still splendid. What makes Vetiver remarkable is that it has two qualities at odds with one another which carry through the scent for most of its life. There's a bright, fresh, live element to it, the smell of leaves and green things, and also a deep earthiness. the smell of roots and humus with a suggestion of licorice. What's amazing is that these two qualities are polar opposities--life and death, bright and dark, aboveground and subterranean--and yet somehow in Vetiver they are the same thing. except that rather that seeing the two things alternately, you're seeing them both at one time. It ought to go without saying that taste in fragrance is intensely personal, and if you don't care for vetiver, then you will hate Vetiver, which is pungent and piercing. It will not be ignored. It is not the sort of thing you should wear, unadorned and in quantity, in public. However, Vetiver makes a great layering scent: it can do a lot to improve a lacklustre men's scent (though why would you be wearing a lacklustre scent to begin with?). I'm guessing, though I haven't had a chance to try this yet, that it would also play well with some of the darker Demeter fragrances such as This Is Not A Pipe, Incense, and some of the leathers. Time to play alchemist!